So a couple weeks ago I received this product from Cosmetic Jolse for review purposes - so first off, thank you Jolse! A lot of people don't give too much thought when it comes to toner and I have known of people who skip this step altogether in their beauty routine. Personally I've never skipped this step as it's the first step to hydration for my skin, and also wiping off any excess sediments or particles from the water I've used on my face. Instantly rehydrating your skin after cleansing will make it more effective in absorbing other products that you layer on as the first layer of the skin will be softened, meaning other products can penetrate deeper. This is the kind of texture that I absolutely love from a toner: lightweight and easily absorbed when patted on to the skin or swept across the skin. There is zero fragrance in product, which is great because who needs artificial smells in a skincare product anyway. I've never been fond of those "smelly" ones myself, and additional/artificial fragrance is not normally embraced in skincare. I have to admit that I was slightly confused by the word "lotion" as a lot of Western skincare I used, "lotion" does not equate to "toner". I know this segment is rather short, but I honestly can't find anything that I didn't like in both texture and fragrance. It's everything that I am fond of in a toner, and as the first product that touches my skin after cleansing, it's perfect for it. This toner, and brand, prides itself on 2 major things: 1) hydration, and 2) ph 5.5, and in my mind, they've definitely nailed hydration. I've carried this toner with me for a 5-day trip down to Cornwall, UK, the very south of the country with fresh air and salty winds. The salt makes the air really dry, and thus really hard for skin to retain moisture. I was there back in December (winter) and absolutely parched everyday and have to constantly hydrate myself by drinking a lot of water. Needless to say, my skin felt the same - already dehydrated skin in dry atmospheres will only get even more dehydrated. It may be summer, but the air is still dry and perfect for trying this toner on its own to see how it performs. Spoiler alert - I didn't feel the dryness in my skin, nor did my skin produce extra oil to combat for the dryness. I was truly surprised by how effective this toner was for my skin, but, I have to say that it is a combination of using the 7-skin method and this toner. It might be a little hard to see, but I've done a little comparison between before and after application my the back of my hand. You can tell that my skin is very dry, but after application (one layer), it's absorbed it well and now has a slight moisture glow. I've used this for both AM and PM during my trip and used this toner for the 7-skin method in some evenings as I had no sheet mask with me - quick tip, this is great if you don't have a hydrating sheet mask, this is basically like an express hydration treatment for your skin in the evening. This product contains squalane (derived from olives by the look of it! ), which is a humectant, meaning that it helps retain moisture within the skin; so not only does this toner add moisture, it also helps the skin retain it. This is what they coin the "dual moist" system, where squalane and hylauronic acid work together to relieve dryness and regain elasticity. I believe this helped in sleeping through the night without losing as much moisture in the skin as I would have. In the morning, using this toner for the 7-skin method provides a good, hydrated skin base for makeup application. I've used a few different toners and before this toner, I've favoured the Decleor toner that has the same texture (bit more watery, but is "smelly") that gave me a beautiful hydrated glow. I prefer this Olivarrier toner over Decleor because I definitely feel more of the hydrating factor in this toner than Decleor, even when both toners sits beautifully on the skin. A quick side-note - from personal experience, you can tell what toners are hydrating and work for you with the 7-skin method! I've used the Proud Mary toner and because it's quite thick I felt like my skin was weighed down by it. It could be other ingredients within the toner too that gave that feeling, despite still being hydrating. Back to Olivarrier - even if you're only patting one layer on, or using a cotton pad to swipe across your face, you will still feel this product doing its job on your skin. I didn't use any serums on my face for the duration I was there and put moisturiser straight on top of this toner (swiped on once) and my skin hasn't dried out through the night. That being said, we can't rule out that it could be the moisturiser that I've used (Nip & Fab Kale Fix moisturiser). All in all, I've been really pleased with the results of this product and does everything what I would expect from a toner to do without leaving a sticky residue like my Proud Mary toner. The skin still feels really fresh, not weighed down and the product is so well absorbed into the skin, PLUS it's got squalane that helps with retaining moisture throughout the day. Every other review seems to talk about packaging, it's only fair that I talk about it too... well, what can I say - I can't pick any faults in this product's packaging. The box and the tube are both sleek, monochome - just really straight forward. Plus the box opens up and you can see what's written inside in different language. Ingredients are shown clearly (no alcohol!) and the product dispenses effectively - I was so, so glad it wasn't a pump or a spray! I only wish you can sort of see how much you've used with this product though, as that's always been helpful in determining when I have to buy a new one. I love this product. I've never really been that picky with toners until lately, and because I use toners so frequently I tend to go through them quickly too, especially with the 7-skin method that I (semi-religiously) do. 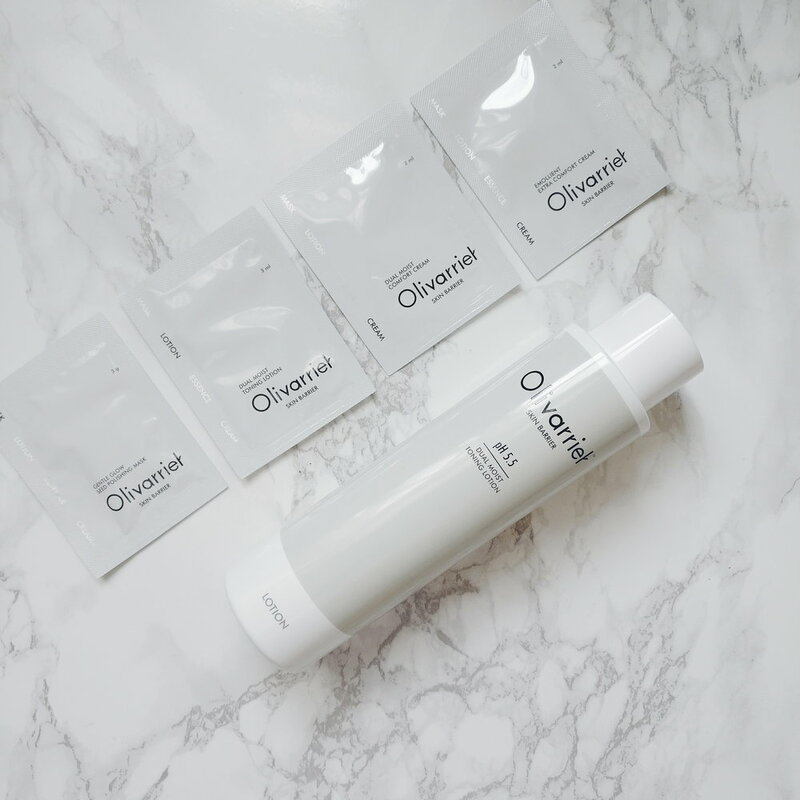 I've used toners of the same texture (Decleor, Liz Earle), but Olivarrier is far superior in the ingredients it contains, with the added benefit of having squalane that helps retain the moisture in the skin. Your skin feels hydrated upon first application - the back of my hand was pretty much bone dry before I put it on at the beginning of this post; it's been an hour and the applied area still feels soft - remember I only had the toner on, no hand lotion or anything. I've used this product for 5 consecutive days, which may be a little short to conclude its effectiveness, but I do feel it's easier to tell with toners. I do feel that my complexion has improved, whether it was due to this toner or the amazing amount of fresh air down in Cornwall - we shall see how it performs now that I'm back in the city! The pH 5.5 boasts that it will protect the skin from pollution and build a stronger skin barrier - but how do you determine this? Fair enough that it is close to the skin's original pH, but it may take a good period of time before you really feel the effects of it. I'd recommend using a low pH cleanser in addition to this to build up the skin barrier. The only issue I have with this toner is the price (because I'm stingy). It's priced at USD$28.00 - but to be fair, I've seen other toners at this price too so I guess it's still in a reasonable range? Cosmetic Jolse has discounts for brands frequently and their own incentive system and right now this product is USD$23.80 (you can see it here). Would I purchase it? Likely, but only because there are other toners on my list that I would want to try out too, otherwise yes, I would still buy this. That's all from me for this review, I hope this has been useful for you and if you have questions don't hesitate to leave me a comment!